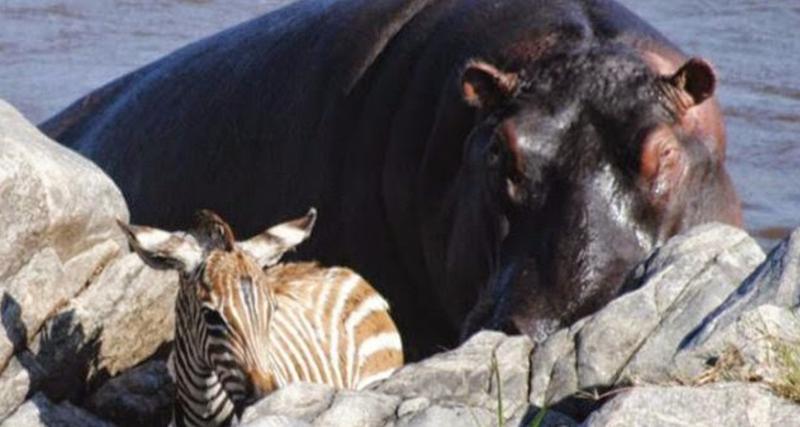 In an amazing display of apparent compassion for other fellow sentient beings, a hippo is captured helping zebras and wildebeests who had trouble crossing the river, get across safely to the other side. The video was captured by Tom Yule, the manager of the Grumeti Expeditions touring company. Tom Yule said: “This is the time of year that the migration of wildebeest and zebra starts moving south from the Masai Mara in Kenya, heading for the short-grass plains of the southern Serengeti,” said Yule. “One of their big hurdles is the Mara River, which was flowing very strongly that day because of recent heavy rains.” Yule and several others saw the strong current sweep a young wildebeest calf downstream. Barely five minutes later the water swept away a zebra foal. The hippo immediately set off after the foal and helped it toward the opposite bank in the same way. “It was incredible to watch,” said Yule. The foal was utterly exhausted when it eventually managed to get on to a little rock island very close to the opposite bank. What kind of world we would have if human beings were like this?! Please share your thoughts on this amazing hippo.